To build cultures of peace, one must often lay aside the "expert" label and become a student in the world who is willing to learn from other cultures in pursuit of peace. To set up an intercultural dialogue on this topic, the Committee for the Psychological Study of Peace, in conjunction with the University for Peace and the Institute for Psychological Research of the University of Costa Rica, sponsored the 6th International Symposium on the Contribution of Psychology to Peace. This special issue extends the dialogue which began at the Symposium. *psychologically informed policies for the promotion of cultures of peace, including the importance of gender equity. 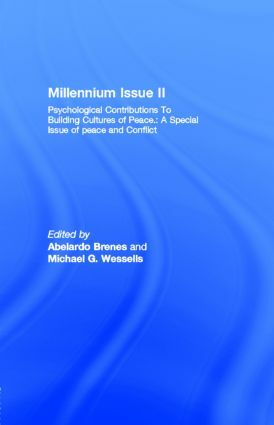 Contents: A. Brenes, M. Wessells, Introduction: Psychological Contributions to Building Cultures of Peace. E. Lira, Violence, Fear, and Impunity: Reflections on Subjective and Political Obstacles for Peace. C.J. Montiel, M. Wessels, Democratization, Psychology, and the Construction of Cultures of Peace. D.J. Christie, A. Dawes, Tolerance and Solidarity. D.M. Mayton, II, Nonviolence Within Cultures of Peace: A Means and an Ends. A. Brenes, D.D.N. Winter, Earthly Dimensions of Peace: The Earth Charter. A. Anderson, D.J. Christie, Some Contributions of Psychology to Policies Promoting Cultures of Peace. REVIEWS. H. Richards, Transforming Conflict Transformation. R. Ardila, Science, Technology, and Peace. A-S.J. Hatay, Making Interventions Work.